Our 3D System has been designed and put together by Stereographers, after detailed discussions with cinematographers & directors working in 3D today. We've built our system to be mobile, flexible and fast, so a 3D film can be shot at the same speed as a 2D film. Skywork 3D System includes live 3D capture, to monitoring, to data stations is housed in quick-setup travel cases. Skywork 3D is a proven, reliable and bondable system having photographed major studio releases as well as commercials. We are pleased to offer the Skywork 3D System as a rental package for your 3D production. Skywork 3D Technology relies mainly on the world's best fully automated 3D Rig, "TS5" by 3ality. This is a lightweight camera platform optimized to take full advantage of the small form of the RED Dragons, Epic and Alexa M. The result is a rugged, stable, wide-angle 3D beamsplitter system weighing as little as some single 35mm camera systems. 3ality Technica's TS-5 beam splitter offers the ultimate in both adaptability and precision. The TS-5 can be used handheld or perfectly balanced when mounted on a Steadicam. It's made to fit into those tight spaces and weight-constrained spots that won't accommodate a larger rig. Weighing just over 17 pounds without cameras and lenses, it's easy to maneuver, ensuring that you'll get the shot every time. 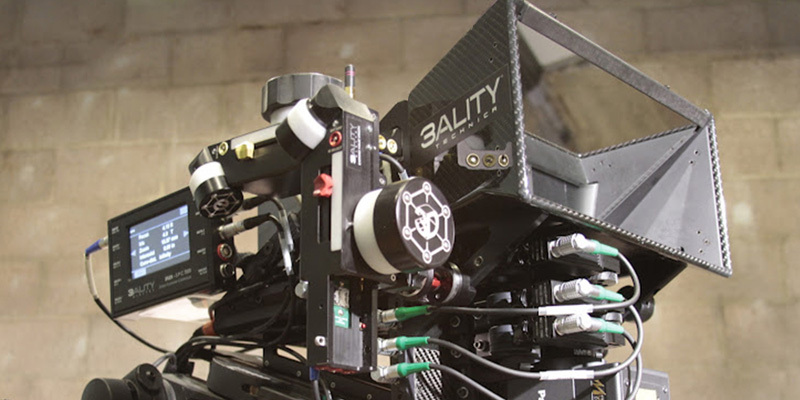 Our System is equipped with Premium mirrors, ¼ Wave attenuators, Carbon fiber eyebrow system, AC power and dual hot swap backup batteries with enough backups to ensure that production is never at a halt due to 3D. All components are housed in rugged travel cases, ready to go. For instance, our 47" 3D Directors Monitors: Open the lid, slide the monitor up and rotate. Cable connectors are located on the exterior of the case. 25.5” Panasonic or 15” TV Logic 3D monitors are also available for easy mobility, so this can be a second monitor can be setup near the Rig, a 3D monitor on the go. SIP (Stereo Image Processor) by 3ality is always connected to our convergence carts. The SIP facilitates stereo alignments and control of the rigs even during the shot and assures you're shooting faster with 2-3 minute lens changes and the alignments are fixed on the fly, without any delays. So the production is never waiting on 3D using the Skywork 3D System. Skywork Video Assist Cart with Qtake HDx2 for the live 3D monitoring and playback in normal to high speeds. Our Data Management and Color Management carts include RedCine, Davinci Resolve, 8TB Raid backup, backup power, 1 x 2D monitors and 1 x 3D monitor. Primes are our suggested lenses of choice for shooting a 3D feature and our standard kit consists of matched set of Zeiss Ultra Prime T1.9 lenses. 16mm, 24mm, 32mm, 50mm, 85mm, 135mm. Skywork rigs feature 6-axis wireless lens controls and wireless 3D controllers along with wired SIP control, so the alignments are computer controlled and do not require any manual intervention. This ensures that the production will save a lot of money in post, as our system allows Stereographers to shoot right without having to rely on post houses to fix things later. Skywork Studios Inc. All rights reserved.